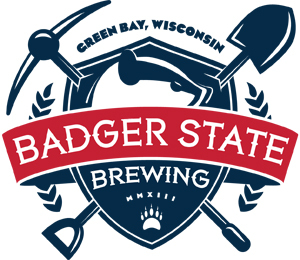 Developed as one of three flagship ales, Bunyan Badger Brown is the highest-gravity and darkest ale currently in year-round production at Badger State Brewing Co.
Brown ale is celebrated in English literature for good reason: It is a splendid style that is often overlooked. Badger Brown is a brilliant textbook brown with reddish highlights, a vibrant depth of color topped with a thick head. This is not exactly a session beer, but it is easy to drink. There is a nice rich mouthfeel and balance of malt and hops on the palate with no bitterness. The biscuity, earthy flavors go with almost everything. We relished it with brown bread, rare grass-fed wagyu beef steaks, fried Walla Walla onions, fresh cauliflower au gratin and, of course, brownies with a brown ale cream sauce. Brilliant copper-brown ale with pleasant nutty, toasted, cocoa notes in the aroma. Medium-light body suggests a refreshingly drinkable mild ale. Grassy fermentation flavors combine with delicate roast malt character. Hop bitterness and slight acidity linger along with astringency from dark malts. A chocolate cupcake could go very well with this brew. Founder of Merchant du Vin and the Pike Brewing Co., Finkel is a pioneer in the marketing of craft beers in America. Author of the New Complete Joy of Homebrewing, founder of the Great American Beer Festival and National Beer Examiner at examiner.com. Papazian is a leading voice in beer and brewing.